See the previous post for setup instructions. If you don’t have a tool with Map View or if you have problems displaying the objects (for example not enough resources to display them all) you can use the SDO_GEOM.VALIDATE_GEOMETRY_WITH_CONTEXT() function to check if they are valid. Pass your object into the function with a tolerance. It will return TRUE or FALSE. For example, I have used this function to validate the line exercise answer from the previous post. We want to create a home for our dinosaurs so let’s look at some examples to create polygons using different methods. Let’s make a simple rectangle using 2 points on opposite corners. This creates a rectangle with one corner at Lon-0, Lat-0 and the opposite corner at Lon-0.9, Lat-0.9, approximately 100KM East and 100KM North. Let’s make another simple rectangle using points for all corners. Notice that when we create a simple exterior polygon we define the points in counter-clockwise order, also the first and last points are the same. This could be an OK home for our dinosaurs, it’s 100 KM by 100 KM, but living on a rectangle could be kind of boring. Let’s make it more interesting. This time, we’ll create an irregular shaped polygon. This is basically the same as the last rectangle polygon but we’ll be using a few more points. 2. Create the same rectangle but this time, using 4 points to define the corners. 3. Create an irregular polygon near the center of the Bermuda Triangle using at least 8 points. Note: when creating this type of polygon (1, 1003, 1), be careful to ensure that none of the lines cross or the object will be invalid. Also, as with lines, if your object is “off the map”, it will be invalid. Experiment with other polygons using different point sets. Now it’s time to start adding some data for our dinosaurs and their island. We’ll start by building populateData.sql. Here’s a stub to get you started. At the start of our script we are clearing any previous changes in order to maintain a clean set of data. We’ll be storing our data in 2 tables. Our polygons that designate an area will be stored in the DD_LOCATIONS table and we’ll keep track of where our dinosaurs are in their member record using the DD_MEMBERS.SPTUT_LOCATION column we created in the setup. We will be storing sdo_geometry objects. These objects must be created using the same SRID (4326) we used to populate user_sdo_geom_metadata in the setup script. We will not be going into detail on the metadata and indexes, but if you receive an error mentioning SRID, it’s probably due to mismatching the SRID. 1. Insert the polygon we previously defined into the dd_locations table with a location_name of ‘dino-island’. 2. Update our admin dinosaur (member_id = 0) and set the location to a point inside of ‘dino-island’. Most of the time you’ll be creating pre-defined objects. But, one of the reasons our dinosaurs have been able to stay undetected for so long is their island randomly changes shape every now and then. In previous exercises, we created our polygons one point at a time in a counter-clockwise direction so we should be able to do this programmatically with some random coordinates. On the first attempt to create a random polygon, I went with an idea to walk the edges of a square and define points a random distance in or out from the edge. While this did work, the function was a bit more complicated than I wanted, involving nested loops and multi-layered if/then statements. I decided to go with a circular approach instead. Here are examples of a couple useful functions. A radian value from 0 to 2pi. The gif here explains what a radian is perfectly. Note: SDO_UTIL.POINT_AT_BEARING uses 12 o’clock as 0 radian and increases clockwise. The function returns an SDO_GEOMETRY point object, X meters from the given point in the direction of the radian value. SDO_UTIL.GETVERTICES can be used to extract quite a lot of data from our point object, but since we’re only interested in the x / y coordinates we will treat the output as a table and select the values. A minimum radius. We need to ensure that our dinosaurs have land to stand on. A variance percent that we will use to calculate our random edge points. The function should return a valid SDO_GEOMETRY simple polygon object. Change populateData.sql to use the new function for the dino-island value, centered in the Bermuda Triangle. we'll change our v_cur_radian to a negative value. Now that we have an island lets figure out where the rest of our dinosaurs are. We want to make sure our dinosaurs are all on the island. We could take the easy way out and just use the POINT_AT_BEARING function with a random radian and distance from 0 to the minimum limit used to create the island, but that leaves a lot of unused space out by the beaches. 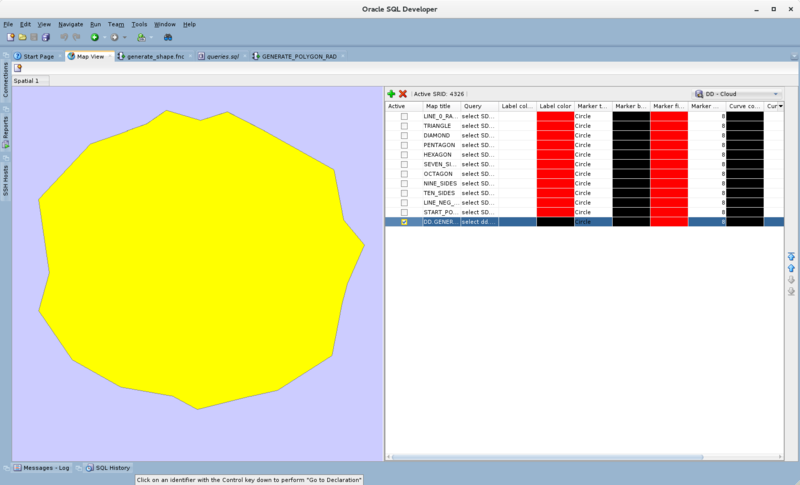 SDO_GEOM.SDO_INTERSECTION accepts 2 SDO_GEOMETRY objects and returns just the overlapping section. Pass in your dino-island and a line starting at the center that is long enough to extend outside of the island. You will get back a line from the center that stops right at the edge of the island. SDO_GEOM.SDO_LENGTH accepts an SDO_GEOMETRY object and returns different information depending on the object passed in. We’re passing in a line so it will return the length of that line. You may notice that these two functions accept a Tolerance parameter. The tolerance value determines how close two adjacent points have to be together to be considered the same point. So passing a value of 0.05 means: Points which are closer together than 5 centimeters, are considered to be one point. The island as an SDO_GEOMETRY simple polygon object. The island’s center point longitude. The island’s center point latitude. The function should return a valid SDO_GEOMETRY point object located inside the island polygon. Change populateData.sql to use the new function to update the dinosaurs locations using the same values as the island. Using this information and the methods you’ve used previously, you can generate random points around the island without having to worry about dropping any dinosaurs in the ocean. Using this specific methodology will tend to favor placing dinosaurs in the center of the island since the location always starts from the center and goes out. Feel free to try other methods to create a more random dispersion. The function generate_random_location works well enough to generate a point inside a polygon if you already know something about it. Let’s change it so it can accept just the polygon and figure out the rest of the data we need. We still want to make sure our dinosaurs are all on the island. SDO_GEOM.SDO_MBC_CENTER accepts an SDO_GEOMETRY object and a tolerance. The function calculates the Minimum Bounding Circle, which is the smallest circle that could contain the object. It then returns an SDO_GEOMETRY point object for the calculated center of the MBC. SDO_GEOM.SDO_MBC_RADIUS accepts an SDO_GEOMETRY object and a tolerance. The function calculates the Minimum Bounding Circle, which is the smallest circle that could contain the object. It then returns the calculated radius of the MBC. Change populateData.sql so it uses the new function to update the dinosaurs locations using only the island. 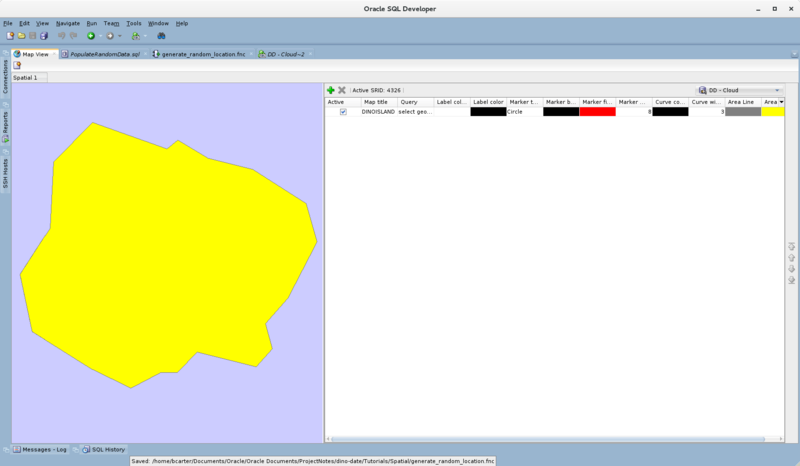 Run populateData.sql to generate an island and update the dinosaur locations. Now that we have an island and we’ve scattered the dinosaurs, let’s figure out where they are. SDO_WITHIN_DISTANCE accepts two SDO_GEOMETRY objects and a parameter string. The first SDO_GEOMETRY object must be in a table and have a spatial index. The parameter string is a set of parameters defined in the linked document, for our purposes we are using distance and unit. If the two SDO_GEOMETRY objects are within the given distance the function returns ‘TRUE’. SDO_RELATE accepts two SDO_GEOMETRY objects and a mask parameter. The mask parameter specifies the relationship you are testing. See the Usage Notes section of the linked documentation for a list of valid options. Alternatively, if your objects are not both in tables or you are trying to determine their relationship you could use SDO_GEOM.RELATE but it is less efficient since it does not leverage a Spatial Index. Write a query that finds all of the dinosaurs within 5 KM of the beach. Write a statement that creates a smaller polygon with a minimum radius of 10 KM and centered randomly inside the island. Using the location_name of ‘asteroid-impact’ insert this polygon into the dd_locations table. Write a query that finds the dinosaurs inside the ‘asteroid-impact’ so we can warn them to move to safety. 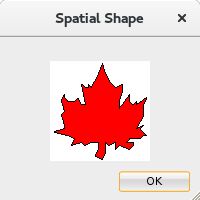 There are many more functions and capabilities included with Oracle Spatial, this tutorial has barely scratched the surface. The ‘answers’ I have included are merely suggestions and there are many other ways to complete the same tasks. Please dig into the documentation and experiment. Please leave comments if you have any questions, corrections or suggestions. In this tutorial, we’ll go over how to create some basic spatial objects such as points, lines and polygons. We’ll create some random objects and run some fun queries. We’ll be using the Spatial and Graph Developer’s Guide as our reference. First, let’s take a look at the SDO_GEOMETRY Object. L = Linear Referencing System. This is a more advanced topic for another day. For our examples, we will be using 0. We will be using the following Geometry Types. You can find the full list here. DL01 Point Geometry contains one point. DL03 Polygon or Surface Geometry contains one polygon with or without holes,1 or one surface consisting of one or more polygons. In a three-dimensional polygon, all points must be on the same plane. SDO_SRID is a number referencing the coordinate system used, it must either be NULL or the SRID value from the SDO_COORD_REF_SYS table. We’ll be using 4326, which is the standard Earth-based Latitude / Longitude system. SDO_POINT is used to define the object as a point. This is only used if this object is a point, otherwise, this should be NULL and the following two parameters will define the object. SDO_ELEM_INFO is basically a set of numbers that work like a key for using the information in the SDO_ORDINATES parameter to create the object. These numbers are grouped into one or more sets of 3 numbers or triplets. If we are creating a complex object that has more than one segment, each segment will be defined by its own triplet. The first number in the triplet is the SDO_STARTING_OFFSET and indicates which number in the following SDO_ORDINATE_ARRAY is the starting point for this segment. The first element is 1. The second number is the SDO_ETYPE which is used to define the type of object we are creating in this segment. For example, 2 is a straight line and 1003 is a simple polygon. The third number is the SDO_INTERPRETATION and is used in one of two ways. For simple objects such as a polygon, the SDO_INTERPRETATION will further define the type of polygon. 1 is a simple straight line polygon, 2 uses circular arcs, 3 is a rectangle and 4 is a circle. For complex objects such as a polygon with holes in it, SDO_INTERPRETATION is used to specify how many ordinates are used for this segment. Please see Table 2-2 Values and Semantics in SDO_ELEM_INFO for further details. You’ll need a copy of the git repository. Follow the DinoDate install instructions. Run the following as the new DD user. This script will add the sptut_location column to our dd_members table, setup the spatial metadata and create the spatial indexes. We will not be covering these steps in the tutorial. This script can also be used to reset the database if something goes wrong. We’ll need some dinosaurs to locate so let’s randomly generate a few. Connected as dd run the following command to generate 1,000 dinosaurs. If you’d like to restore the DD schema to its default state, run this script to remove the new column and re-create the dd_locations index. For my examples, I will be using Oracle SQL Developer which includes a Map View utility to display the objects. Select the following example from dual to create a point. When you run the query you’ll see it generates an SDO_GEOMETRY type object. 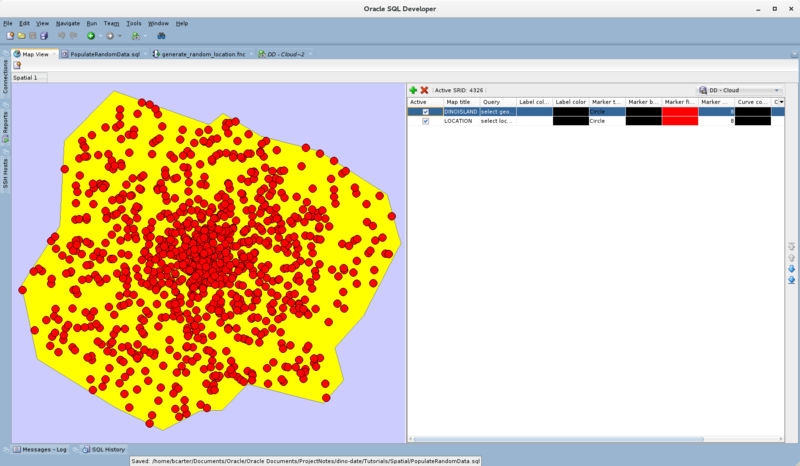 In SQL Developer you can select the results, right click the object and “Invoke Map View on Results Set” to display the point in the Map Viewer. Note that there is no background map displayed, just an empty background with a point. If there were a map, this point would be just west of Africa. Create a point at the center of the Bermuda Triangle – Latitude 26.846786, Longitude -69.322920. If you invoke the map view for both points, you can change the marker type for one to identify which is which. If your Bermuda Triangle point is South East of 0,0 you have your Lat and Lon backward. If this is a consistent issue, you can use named parameters. Select the following example from dual to create a line. This creates a line starting at Lon-0, Lat-0 and ending at Lon-0.9, Lat-0, approximately 100KM East. Experiment with other lines. Keep in mind if your object is “off the map”, it will be invalid. In the next post, I’ll go over creating polygons and run some fun spatial queries. 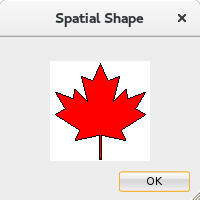 In the previous post, we explored creating basic geometrical shapes with Oracle Spatial with the intention of creating an island that the dinosaurs using DinoDate can live on. One of the main reasons our dinosaurs have stayed hidden for so long is the island they live on constantly changes shape. Let’s build on the function we created in the previous post and add a little randomness to it. First, let’s change the parameters of the function. We’re going to have a random number of ‘sides’ so we can get rid of p_sides and since it will be a random shape we don’t need p_start_radian. To control the how ‘spiky’ the island is, we’ll add a parameter that accepts a variance percent. We’ll use this as a percentage of the given minimum radius and calculate an upper limit for the radius. Let’s add a constant for the upper limit of our island radius and a variable to track our current radian. We’re only generating a polygon, this time, so we’ll extract the loop and drop most of the rest of the code. We still want to make a complete polygon but we don’t know how many sides we’ll be randomly creating. Let’s change the for loop to a while loop and we’ll loop until we exceed 2pi. Our first point will start with a 0 radian. Remember we consider a 0 radian to be pointing in the direction of 12 o’clock. Instead of subtracting radians we’ll convert our radian to a negative value when we generate the point. Either way is fine, so we’ll use this method this time to demonstrate both options. This time, we’ll generate a radius with a random length from our p_min_radius to the c_upper_limit. Finally, we’ll generate a new radian from .1 to .5 radians and increase the v_cur_radian. The loop will continue until our v_cur_radian is > 2pi (asin(1)*4). When the loop is complete we’ll copy the starting point to the end point position to close our polygon and return a new island for our dinosaurs to live on. Now we’ll use the new function to generate a randomly shaped polygon with a radius from 1000 to 1200 meters and we’ll put it at the center of the Bermuda Triangle. You can find the full (nicely formatted) function in this gist. Next time we’ll add some dinosaurs to our new island.